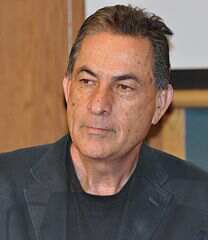 Gideon Levy joins the BDS! This is a courageous move by veteran journalist, Gideon Levy – a man who has always taken a stand for justice and peace but never previously gone as far as supporting the call for Boycott, Divestment and Sanctions (BDS) against his own country! That’s always an easier statement to make when you’re an outsider and don’t have to pay the price yourself, but Levy stands with those who will bear the consequences of BDS. Indeed he is a true patriot! Tags: bds, boycott, divestment, gideon levy, israelis. Filed under israel and palestine articles by Father Dave on Jul 19th, 2013. Comment. This just appeared in Haaretz. It’s enough to make you despair! That God that for every corrupt IDF official, there are other caring and courageous people in Israel like Gideon Levy who know their responsibility to their suffering neighbours. Avi is an inspection coordinator for the “Civil Administration” – the occupation regime, to speak without euphemisms. Presumably Avi likes his job. Maybe he’s even proud of it. He doesn’t bother mentioning his last name in the forms he signs. Why should he? His ornate “Avi” signature is sufficient to carry out his diktats. And Avi’s are among the most brutal and inhumane diktats ever to be imposed in these parts. Avi confiscates water containers that serve hundreds of Palestinian and Bedouin families living in the Jordan Valley. The containers are these people’s only water source. In recent weeks, Avi has confiscated about a dozen containers, leaving dozens of families with children in the horrific Jordan Valley heat, to go thirsty. The forms he takes pains to complete, in spiffy style, say: “There is reason to suspect they used the above merchandise for carrying out an offense.” Avi’s bosses claim the “offense” is stealing water from a pipe. This is why the containers are seized – with no inquiry, no trial. Welcome to the land of lawlessness and evil. Welcome to the land of apartheid. Israel does not permit thousands of these wretched people to hook up to the water pipes. This water is for Jews only. Even the greatest Israeli propagandists could not deny the nationalist, diabolical separation taking place here. The axis of evil is located about an hour’s drive from your home. But emotionally distant and far from the heart, it inspires no “social protest.” And on the scale of Israeli evil, it is one of the worst. Backed with forms and bureaucracy, applied by ostensibly nonviolent inspectors, it involves not a drop of blood, yet leaves no drop of water either. The Civil Administration is supposed to take care of the people’s needs. But it does not stop at the most despicable measure – depriving people and livestock of water in the scathing summer heat – to implement Israel’s strategic goal: to drive them from their lands and purge the valley of its non-Jewish residents. The stealing of water, whether it did or didn’t take place, is of course only the excuse. Even if there was such a thing – what choice do these people have? The authorities won’t allow them to connect to the water pipe running through their fields; pipes whose water is flowing to saturate the settlers’ green vineyards and fields. Last week I saw the people whose water container Avi had confiscated, leaving them thirsty. Newborn babies, a handicapped little girl, a small boy post-surgery, women and old folks, and, of course, the sheep – the only source of income here. Denizens with no water – in Israel, not in Africa. Water for one nation only – in Israel, not in South Africa. But this is not the only watershed. A few days ago, the Israel Defense Forces decided to hold training exercises in the area. What did it do? Evicted the residents from their homes for 24 hours. Not all of them – only the Palestinians and Bedouin. It occurred to nobody to evict the residents of Maskiot, Beka’ot or Ro’i. The authorities don’t call that apartheid, either. Where did the IDF evict them to? Wherever the wind carries them. Thus some 400 people were forced to leave their huts and tents and spend a day and a night on the arid soil by the roadside, exposed to the elements. Amjad Zahawa, a 2-day-old infant, passed his third day under the hot sun, with no shelter over his head. Greetings, Amjad; welcome to the reality of your life. Avi, as we have already mentioned, loves his work and is proud of it. Dozens of others like him are also doing this contemptible work. But they are not the only ones at fault. Behind them stand millions of Israelis who are entirely untouched by all this. They blithely drive through the valley roads, paying no heed to the endless embankment alongside the road, imprisoning the residents and blocking their access to the road. There is an iron gate every now and then. The soldiers, representatives of the merciful occupier, show up every few days to open the gate for a moment. Sometimes they forget, sometimes they are late. Sometimes they lose the key, but what does it matter? The occupation is enlightened, Israel is right, the IDF is the most moral army, and apartheid is merely an invention of Israel’s haters. Go to the Jordan Valley and see for yourselves. Filed under israel and palestine articles, israel and palestine conflict, map of israel and palestine by Father Dave on Jul 11th, 2012. Comment.